Oktoberfest is the world’s largest outdoor party. It’s celebrated all over the world, including right here in Milwaukee, but the main event is in Munich, Bavaria, Germany. The 16-day festival runs from late September to the first weekend in October. They’ve held it there since the early 1800’as and it’s an important part of the Bavarian culture. 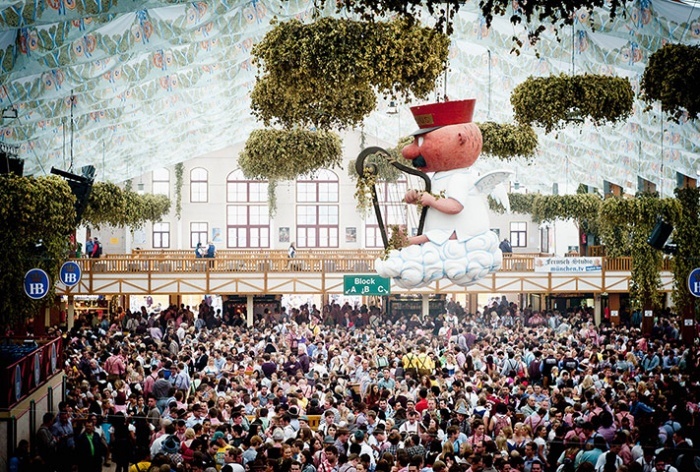 Wiesn, as it’s referred to in Bavaria, is short for the grounds it’s held on. Munich’s Oktoberfest averages about 6 million visitors per year! Most other Oktoberfest celebrations are patterned after Munich’s, they’re just a little smaller. If you like to eat German food, Oktoberfest is a party you don’t want to miss. Here’s a sample of what you can try, Hendl (roast chicken), Schweinebraten (roast pork), Schweinsh axe (grilled ham hock), of course they’ll have plenty of Würst (sausages) along with Brezen (pretzel), Knödel (potato or bread dumplings), Käsespätzle (cheese noodles), Reiberdatschi (potato pancakes), and Sauerkraut. Several of these dishes may sound familiar because they are served at Milwaukee’s Germanfest. Along with Bratwurst another popular wurst traditionally served at Octoberfest is Weisswurst (a short, stubby link with a light, fluffy texture, white in color, speckled with fresh parsley and a hint of onion). In Milwaukee, we too love an outdoor party. Host your own Octoberfest celebration with Usinger’s Weisswurst and Bratwurst. Hand crafted in our sausage kitchen on Third St. in downtown Milwaukee, they are spiced perfectly and great on the grill.